Book synopsis: Cross over to the night and meet your knights in shining darkness.Cross Adademy is attended by two groups of students: the Day Class and the Night Class. At twilight, when the students of the Day Class return to their dorm, they cross paths with the Night Class on their way to school. Yuki Cross and Zero Kiryu are the Guardians of the school, protecting the Day Class from the Academy's dark secret: the Night Class is full of vampires! Rido is gone, but the battle rages on at Cross Academy. The Night Class is still under attack, and Headmaster Cross has joined the war to protect his students. Zero, however, has vowed to get rid of all the Purebloods--including Yuki! Our review: I must admit the reason why I picked up Matsuri Hino's first Vampire Knight manga was because I read it in an issue of Shojo Beat magazine (bye SB! I miss reading you!). I was drawn to the beauty and intensity I saw captured in her character's faces, in particular Yuki, Kaname and Ichijo. When I saw the series was about vampires I knew I HAD to read it and have been hooked on it ever since. Volume 10 came out last June and I finally got around to catching up on this as well as book 11 and Hino has not let me down. The story behind Vampire Knight is of loss, love and survival. As a young child Yuki was saved from a vampire attack by a kind stranger who intervened and took her to someone who could care for her. The adult she lives with also is the head of an exclusive boarding school, Cross Academy. The stranger is named Kaname, a quiet but powerful young man Yuki grows up adoring. Despite not having memories of her childhood, Yuki has adjusted to life with her adopted father and Zero, another child abandoned when his 'hunter' parents were murdered. Much has happened since the first volume and fans will know some huge secrets have been revealed in the last few volumes. I won't spill any details but only say at Cross Academy some people may not be what you first think they are, but it sure is interesting and fun to see their secrets slowly unravel throughout each installment. Hino's drawings for this series always have the power to illicit such strong emotions from me as I read and admire the art. The story continues to capture my attention, even surprising me in this volume with a twist I didn't see coming and can't wait to read more about. I really enjoyed the complexities of some of the lesser known characters being showcased here, like vampires Kain and Ruka. Even Zero's twin brother is likable, or at least sympathetic this time around, as an important scene is played out amongst the two. As a huge Kaname fangirl I did not see my favorite character as much as I would have liked, but Hino gave me enough to make me grab Volume 11 and devour that too. 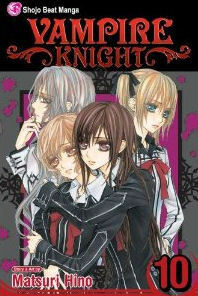 If you enjoy dark, gothic stories involving complex stories of vampires and the secrets they keep, Vampire Knight may be the manga series for you to read. Hino's lovely art will keep your eyes riveted to the pages. Cover comment: This time the girls make the cover and it is a welcome change. Since this volume deals with the four ladies shown here, it makes perfect sense to put them on the cover. You had me at dark and gothic! This one is going on my list!